There are a few general rules that can help immensely in preventing plant diseases. And when it comes to plant diseases, especially in an organic vegetable garden, an ounce of prevention is worth a pound of cure. Many common plant diseases are difficult to treat or cure after they have appeared. Following these general rules will help keep both this year’s and next year’s garden healthy. 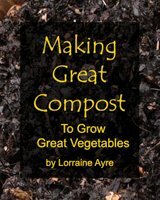 1) Use lots of compost when you prepare your soil in the spring. This keeps the soil organisms healthy and active, which in turn keep your plants healthy and more resistant to all the common plant diseases. 2) Water at ground level rather than using an overhead sprinkler. Many plant diseases are caused by fungus, and keeping the leaves dry - particularly in the heat of summer - will deprive fungus diseases of the moisture they need to thrive. 3) Give plants enough space around themselves so that there is good air circulation around each plant. This means paying careful attention to recommended plant spacings in the spring. 4) Dumpster or burn affected plants. Do not put any diseased plant material in the compost, ever. Keep the ground clean of old crop waste, and mulch the ground with clean straw or composted fall leaves (healthy ones only, no powdery mildew!). 5) Practice crop rotation between years. This means don’t plant the same crop in the same place more often than once every three years (or more, if you have enough garden space). Do this even if your plants are all healthy. Crop rotation is one factor in keeping them that way. Note that crop rotation should be family-specific, not crop-specific, because members of the same plant family share susceptibility to the same plant diseases. For example, peppers, tomatoes, eggplants and potatoes are all in the Solanacea family, so plant them together but then don’t grow any of them again in that same bed for at least 3 years. 7) Make and spray “actively aerated compost tea”. This is not a common practice as yet in the vegetable gardening toolkit, at least not yet. But it should be, because research is showing that the presence of healthy microorganisms on the surface of leaves greatly increases a plant’s resistance to disease. Actively aerated compost tea requires a little know-how, but its contribution to a healthy garden is well worth it. 8) If you use tobacco, no kidding, you will have tobacco mosaic virus on your hands. Make sure you plant only varieties that have resistance to tobacco mosaic virus. For a chart of resistant varieties varieties you can visit Cornell's Vegetable MD Online, or browse the seed catalogs page. 9) Sterilize used potting mix before using it twice, if you start your own seeds indoors in seed flats. I sometimes have a bit left over in the flats after I transplant out seedlings, and at the cost of potting soil, I choose to use the leftover stuff again. I moisten it well first, and then bake it at 400 degrees until it is that temperature throughout. I use a giant stainless steel soup pot that I got from the thrift store for this. 10) Buy disease-free seed. This is a challenging recommendation (and probably applies more to commercial growers), because certified disease-free seed is hard to find. When seed is collected by seed growers, they can use hot-water and/or fungicide treatments to prevent disease from being transmitted on the seed. This practice can prevent sickness from being carried by the seed. However, fungicide-treated seed is not organic.